ALLEGATIONS linking former Vice-President Atiku Abubakar to money laundering and unwholesome financial practices that could be the albatross that would deny the former number two man the ambition of becoming Nigeria’s president in 2011 have been revealed by Lagos-based The NEWS magazine. The magazine, in its current edition which hit the market on Sunday, quoted the details of the report of the US Committee on Homeland Security which indicted Abubakar as being responsible for the laundering of over $40 million (about N6 billion) into the United States illegally. The magazine indicated that the investigations carried out on Abubakar and other African leaders by the US Senate Committee on Homeland Security in a report entitled “Keeping Foreign Corruption Out of the United States” could serve as a hinderance to Abubakar’s ambition in 2011. According to the magazine in the edition with the headline: “Atiku’s Chances: His problems with America,” dated December 6, 2010, the former vice-president was listed among the four case studies of persons who allegedly laundered “illicit” funds to the US. The report which Executive Summary was initially made public after a public hearing by the US Senate Committee headed by Senator Carl Levin on February 4, 2010, listed Abubakar among the four persons tagged ‘Politically Exposed Persons’(PEP), who were used as case studies. Others in the PEP category, including Atiku, are Teodoro Nguema Obiang Mange, sonof the president of Equitorial Guinea; president of Gabon, Omar Bongo and three PEPs from Angola. The PEPs, according to the report, used US-based lawyers, lobbyists, escrow agents, real estate, bankers, as well as university workers to circumvent the US anti-corruption safe guards and launder funds into the country. This act, the reprt claimed, had a corrosive effect on its rule of law, economic development and democratic principles. On his part, Alhaji Abubakar was alleged to have, through his fourth wife, Ms Jennifer Douglas, a citizen of the US, moved $40 million in suspect funds to the United States between 2000 and 2008 through wire transfers sent by off shore corporations to US bank accounts. According to the report, another $2.1 million was transferred by wire through Edward Weirdenfeld, a US lawyer, who represented Douglas, Abubakar and the American University of Nigeria owned by the former vice-president. Though, the lawyer claimed that the transaction was for the Abubakar family legal expenses for setting up the university and he assumed that the funds came from the former vice-president. The list of money laundering allegations against the presidential aspirant included funds allegedly laundered through some American banks, including Citibank, Eagle bank, Chevy Chase, Suntrust Bank, and Wachovia Bank. 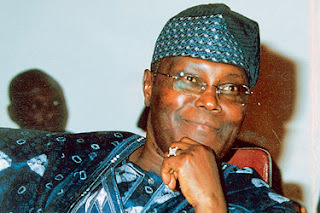 At Citibank in Maryland, Jennifer Atiku was alleged to have opened 18 different accounts, which included personal checking accounts, a home equity account, three accounts in the name of her organi-sation, Gede Foundation and two extra personal checking accounts that were later expanded for the AUN and Jennifer herself. These accounts were said to be used to bring in $20 million suspect funds through the bank into the US. In addition, she was said to have maintained three Citibank credit card accounts, three for herself and Abubakar and one for Gede Foundation. The report alleged that Jennifer lived like a king, paying credit card bills and household expenses in the range of $10, 000 to $90,000 monthly, including hefty legal and financial fees. The magazine further reported that when she was questioned, she claimed the wires she received were from her husband and were proceeds from his personal business in Nigeria, adding that she received income from Gede, in addition to an agreed yearly bonus of $50,000. When allegations of a US inquiry on his person was recently published by the Saturday Tribune, his media manager, Mallam Garba Shehu, said such allegations were aimed at stopping the presidential ambition of Atiku.